If you have visited my blog before, you know how much I love to use nuts and bolts in my furniture. 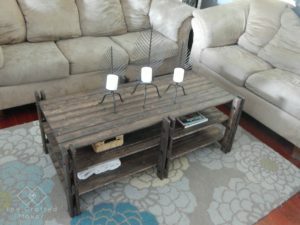 Many of you have embraced (with open arms) my Arhaus inspired coffee table and end table, and for that, I thank and love each and every one of you. 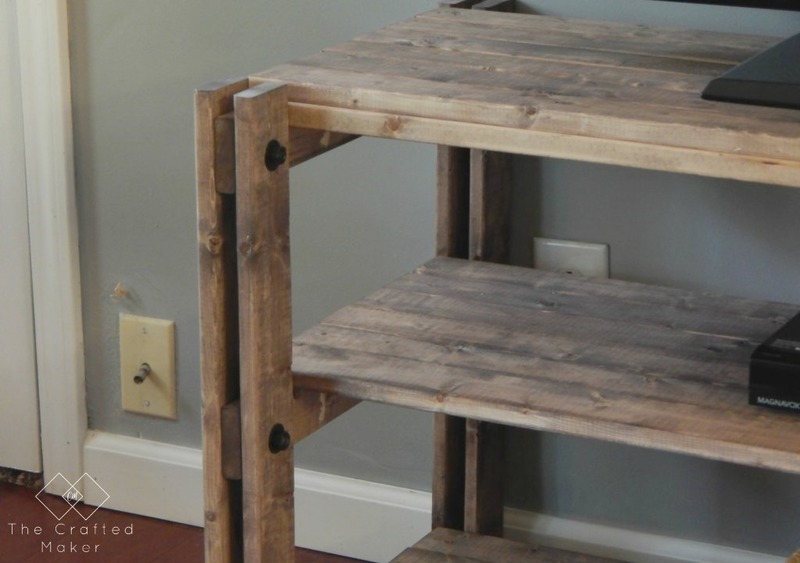 As it turns out, I am not the only one who loves to build this style of furniture. My friend Corey over at Sawdust 2 Stitches also built her own version of the Arhaus coffee table. You can check out the awesomeness here. We put our heads together and decided to make some additional pieces to complete this set of living room furniture. This is going to be soooooo great! 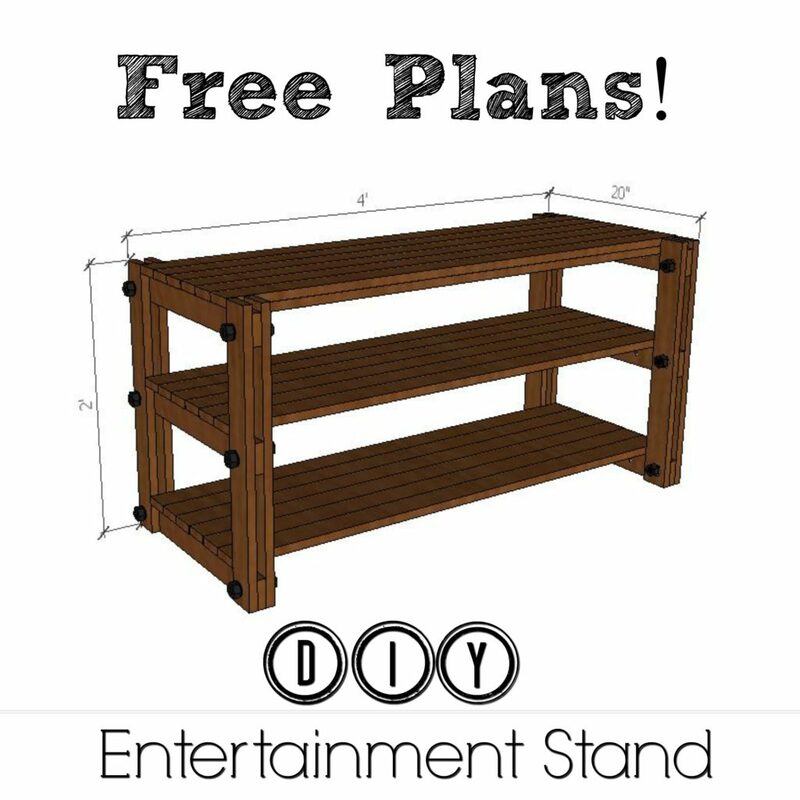 I have included the free plans for my DIY Entertainment Stand here, or click the picture below. 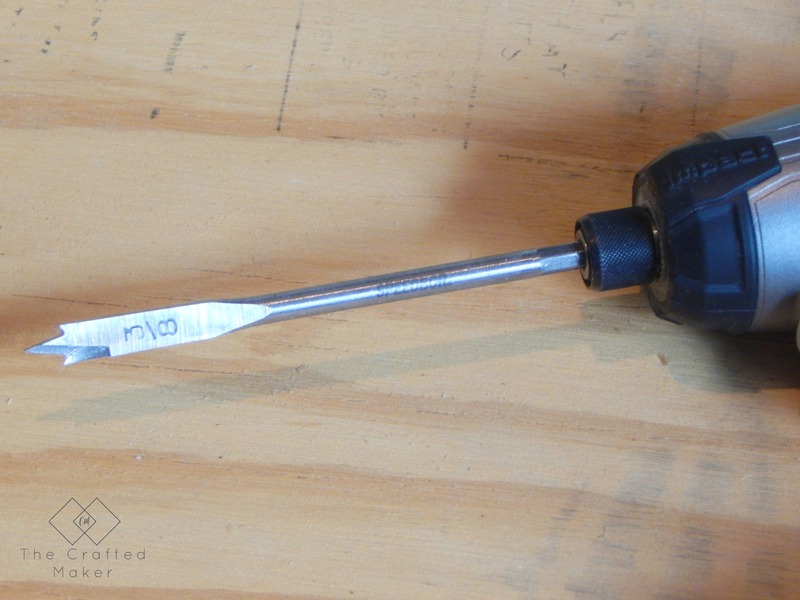 **Optional: Spray paint for bolts, washers, and hex nuts if they are not available in the color of your choice. 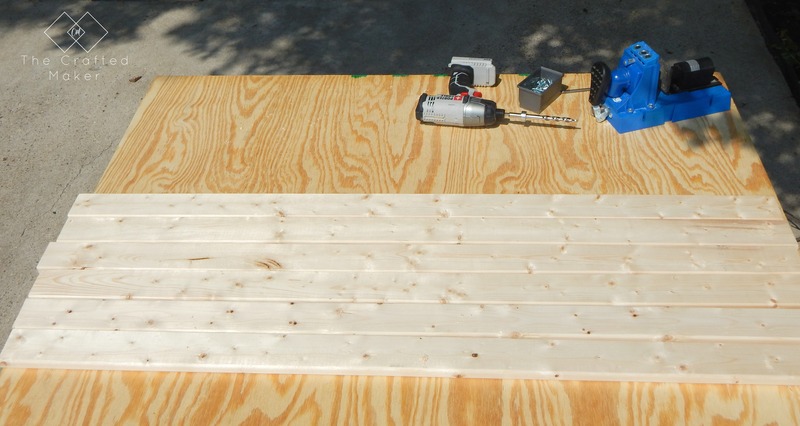 If spraying, do this before assembling the table. Give the paint plenty of time to dry. 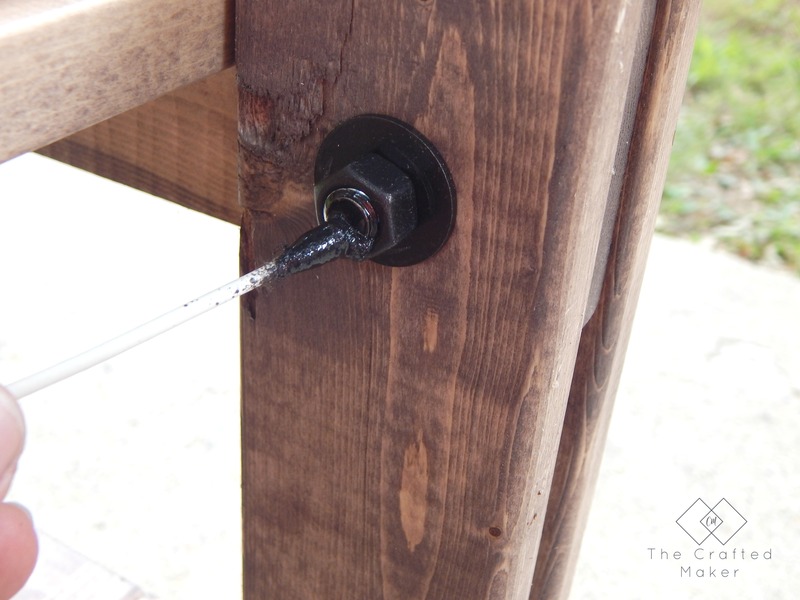 If you are going to paint your hardware, do this first… Drying takes time! 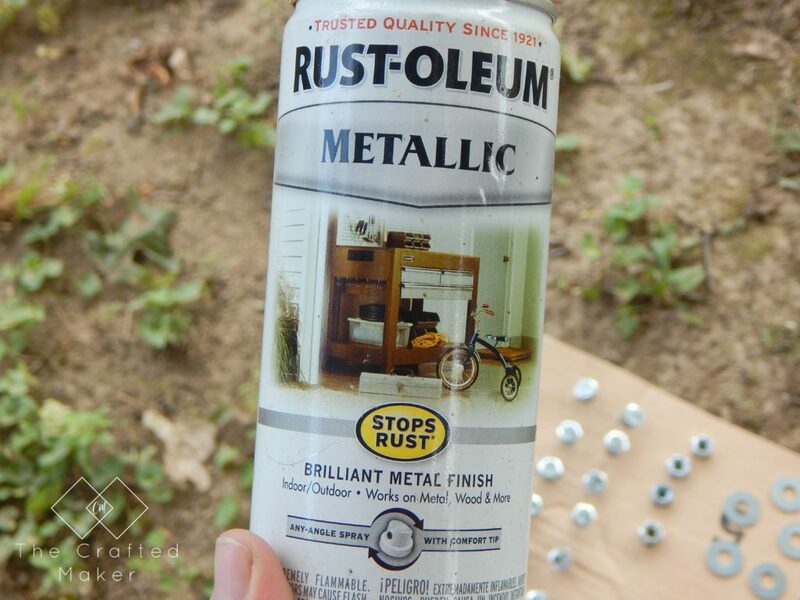 Up to this point, I still have not found a place to buy the hardware I need for these projects in different finishes, so I must resort once again to the ever so fabulous spray paint. 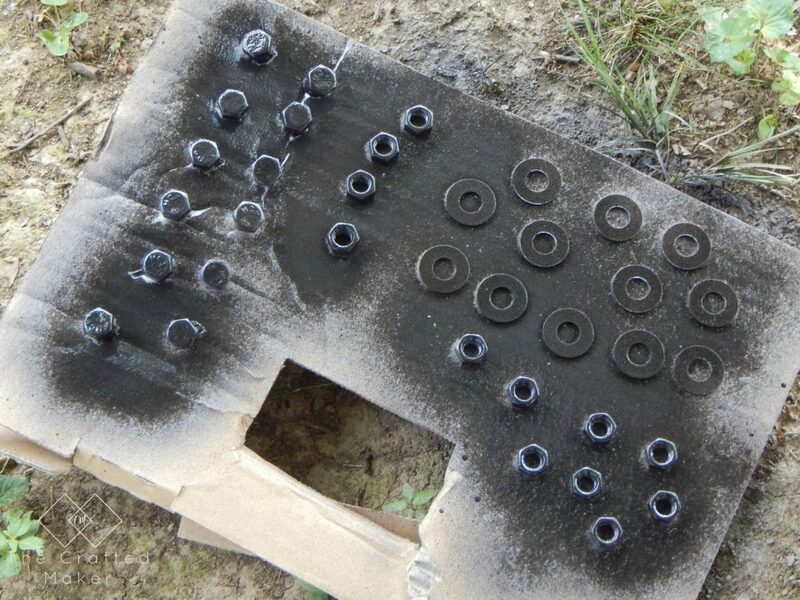 I found an old piece of cardboard, cut holes in it, and slid the bolts through so only the tops were exposed. 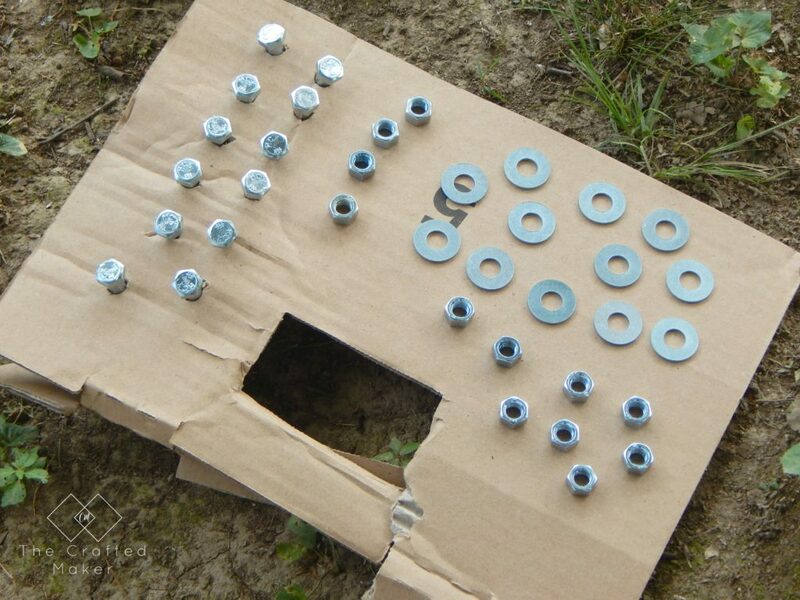 The nuts and washers can be placed flat next to the bolts. I used Rust-Oleum metallic oil rubbed bronze. I started by making all of my cuts according to the cut list in the plan. Next, I drilled the pocket holes I needed and made the holes with the spade bit. 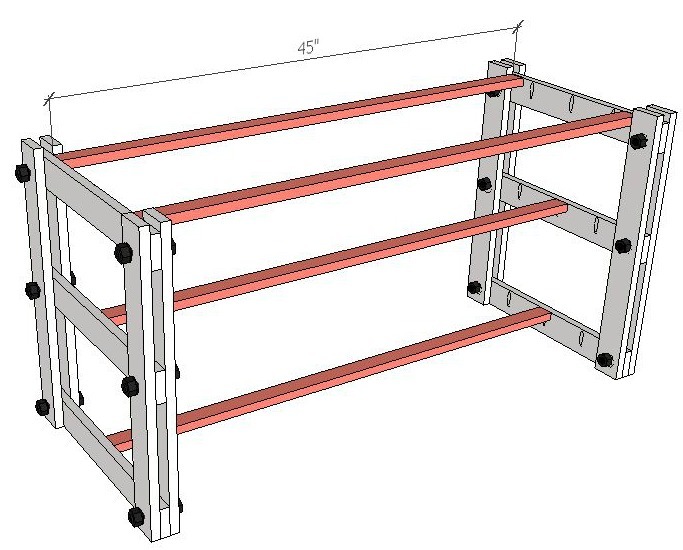 All of the placements and measurements for these are in the plan provided. 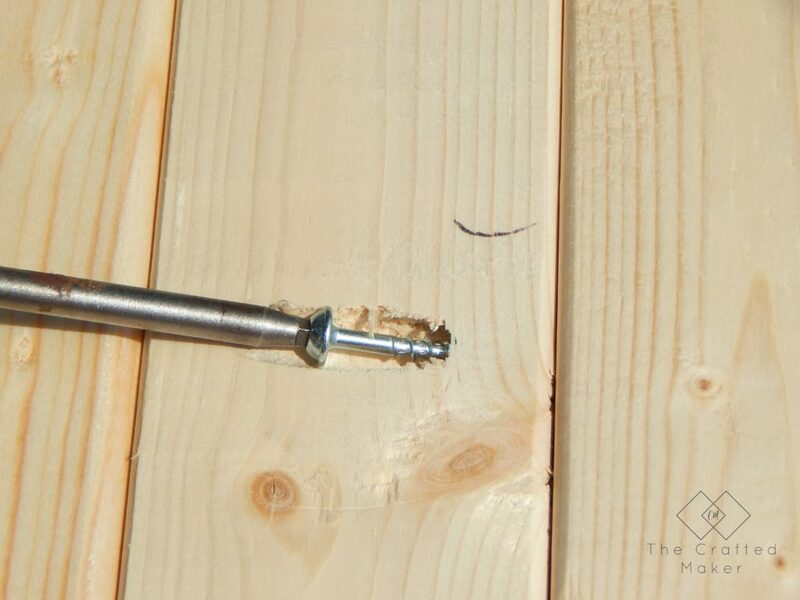 I used a 3/8″ spade bit to drill my holes. This looks like it would be really time-consuming, but once you get in the groove of things, it goes by quick. 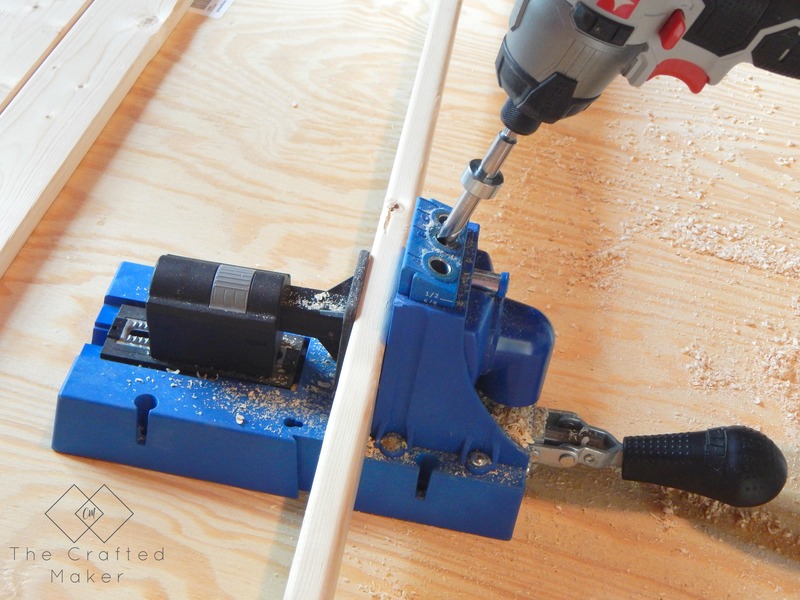 Sometimes I do wish I had a drill press though (I have a huge ongoing tool wish list). 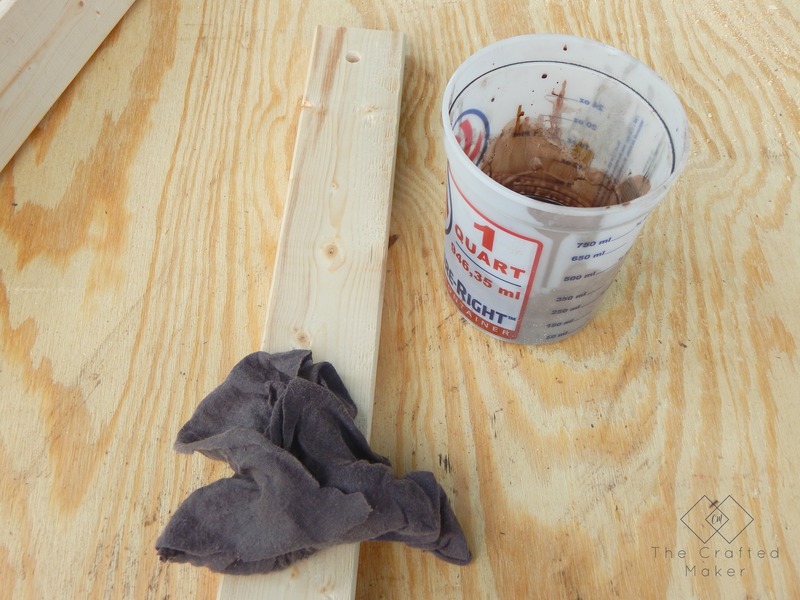 When this type of assembly starts to happen, there is not really a lot of room to work between the boards, so go ahead and sand your boards and paint or stain your desired color. 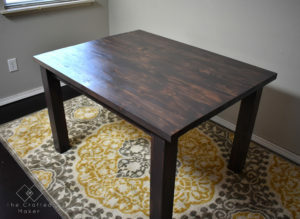 This project was the first time I tried my hand at mixing my own stain colors. I really enjoyed coming up with my own color combination. There will possibly be a post about stain mixing at a later date!! 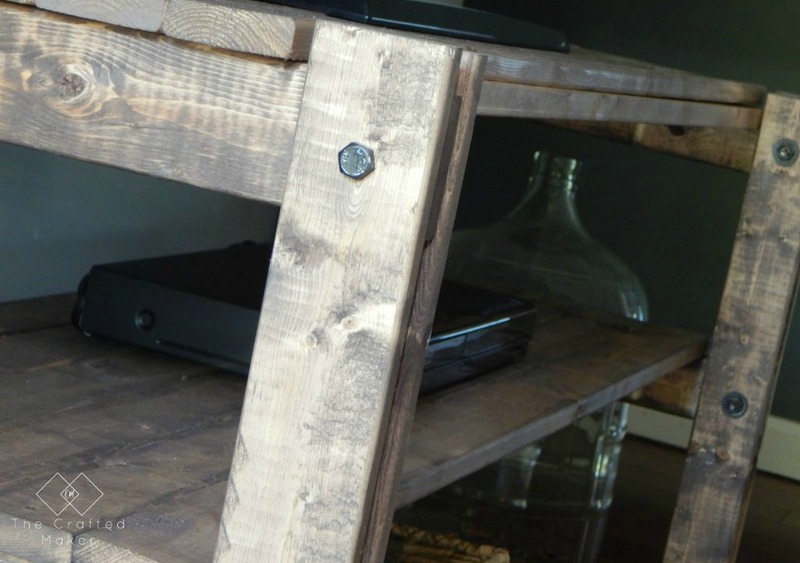 The stain is dry, the hardware is ready, it’s time to start assembling this entertainment stand! The first part of the build is assembling the legs. 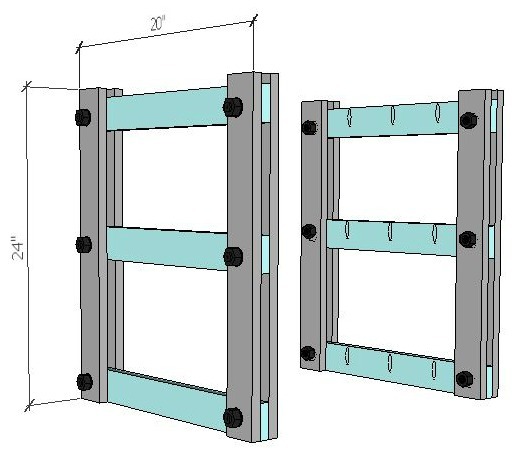 This is done by placing three 20″ 1×3 boards between two sets of 24″ 1×3 boards and fastening with the nuts, bolts, and washers. 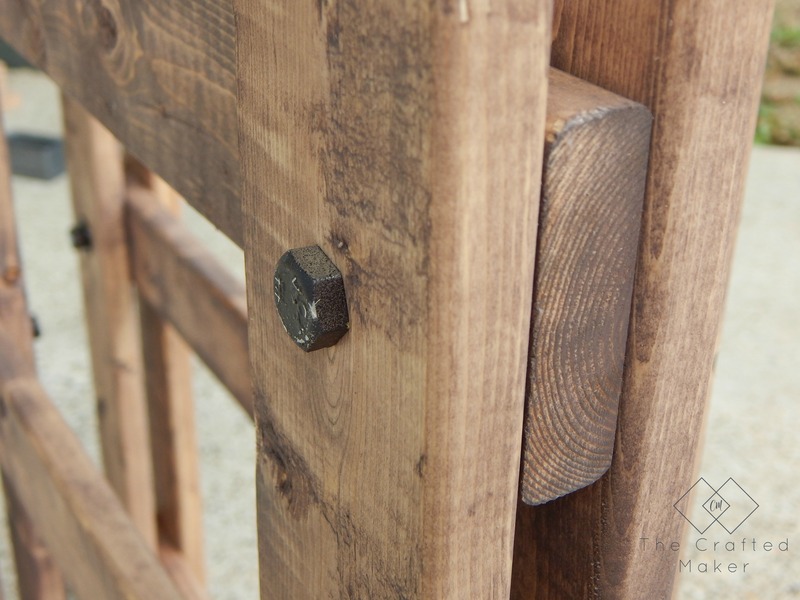 The bolts will fit through all three boards. If you are a visual person, like me, look below at the building plan illustration. I made two of the support legs. Now let’s attach these together and make this an entertainment stand! 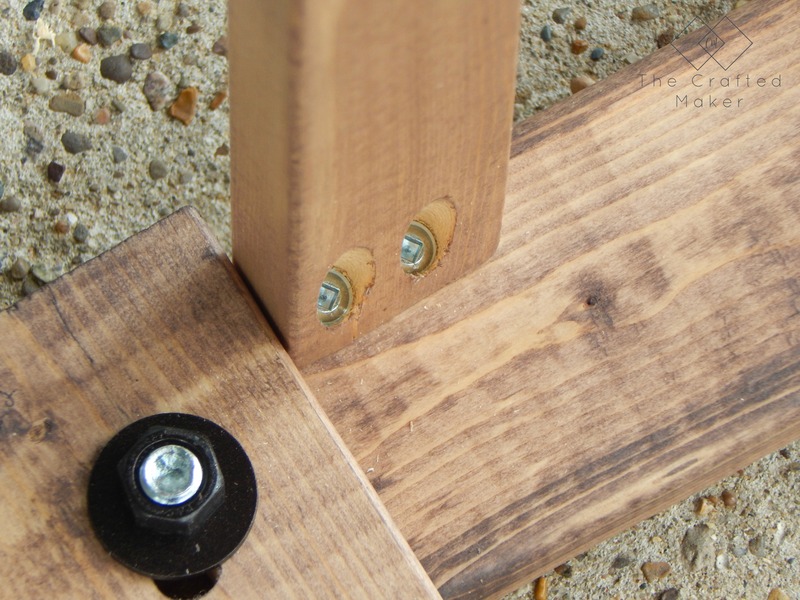 I attached the legs together using the 1×2 boards cut at 45″ secured with pocket hole screws. Since the television is going to be the heaviest thing on this stand, I used two under the top shelf and one under the other two bottom shelves. 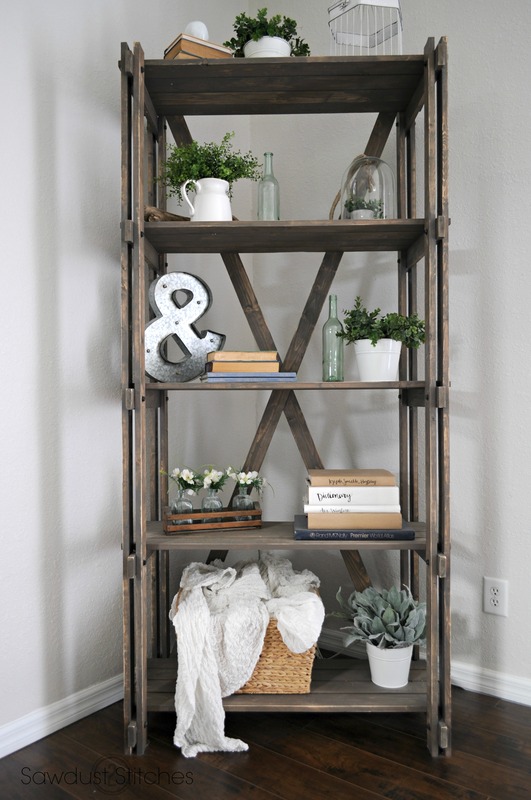 On to the shelves…. 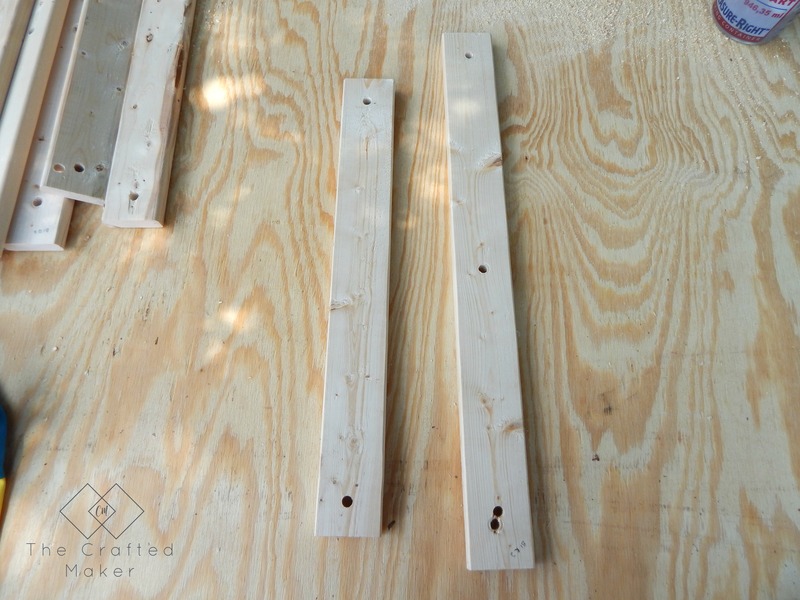 Attach seven of the 1×3 boards cut at 48″ with pocket hole screws to create a shelf. Assemble three in total. 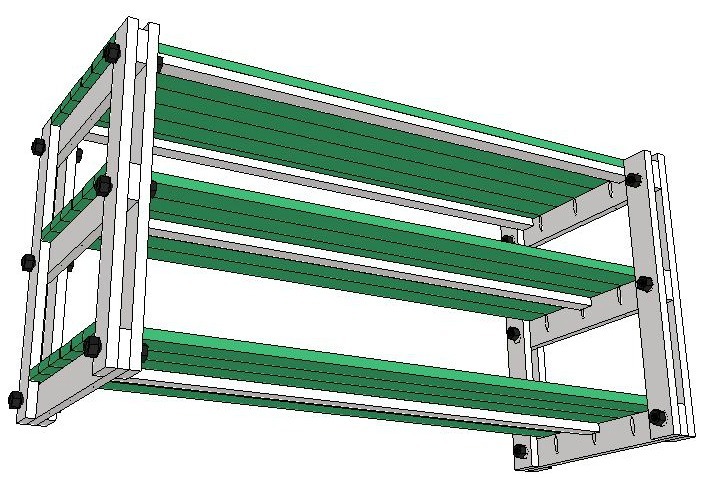 Because of the shelf spacing, it is recommended to start from the top shelf and assemble working down to the bottom. I say recommended, but there simply isn’t enough room to do this any other way. The drill just won’t fit! 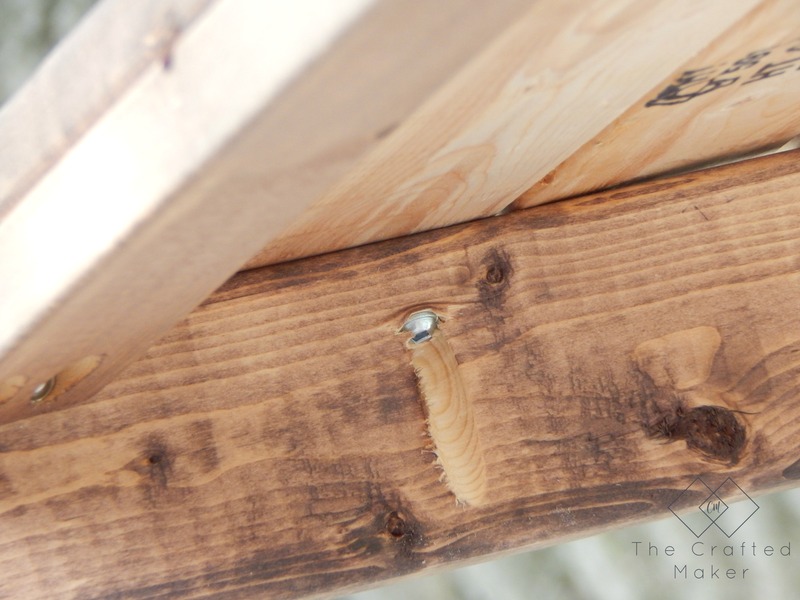 When I started this process, I realized I had forgotten to drill a pocket hole. I wanted to add this in to show you that even the person creating the plan can forget a step. Just keepin it real! 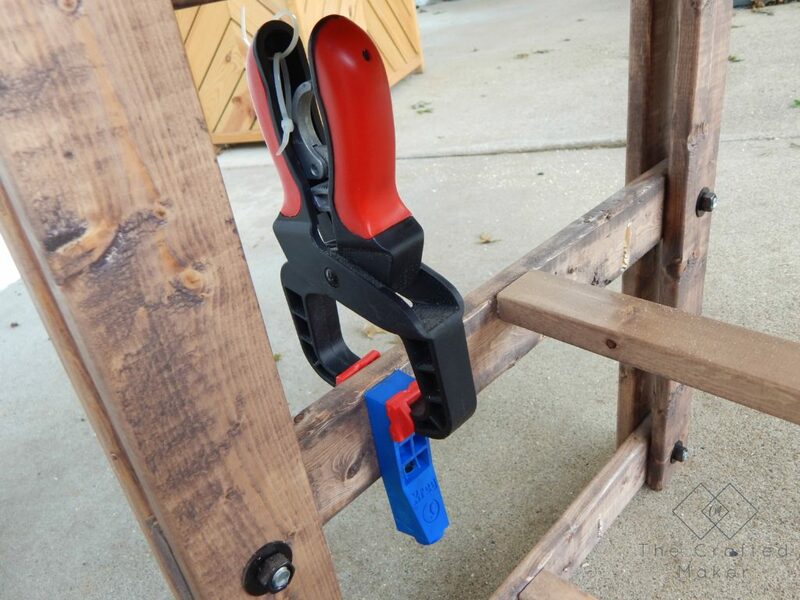 I used my R3 to make a quick pocket hole and went back to assembling. 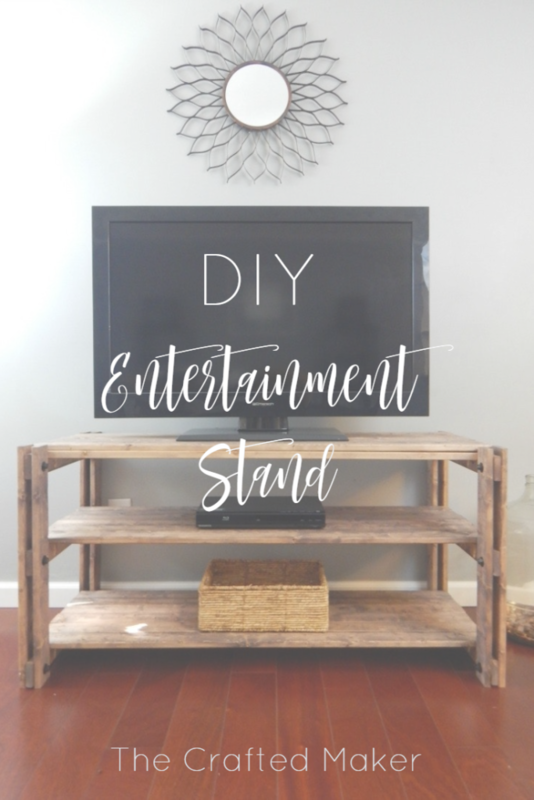 At this point, the entertainment stand is fully built, but there is one last finishing touch to add. If you decided to spray paint your hardware, there is a chance some of the paint may have scraped off during the building process. There is an easy fix for this. Spray some of your spray paint on the end of a Q-tip and dab the paint on. Works every time. I hope you enjoyed following along on this build as much as I enjoyed building it! Now it’s time to reveal the creation that Corey built. Isn’t it just perfection!! Here it is, Corey’s Rustic Farmhouse Book Shelf!! 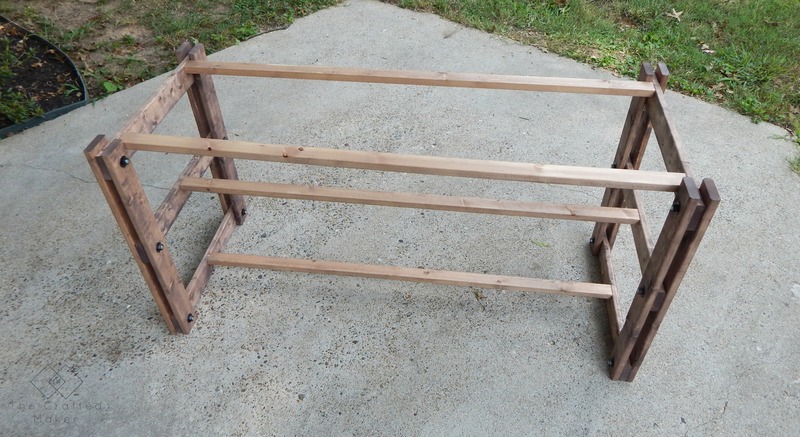 Be sure to go visit Corey over at Sawdust 2 Stitches to see how she built this beauty. Be prepared to be mind blown! 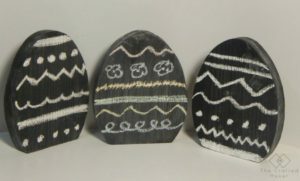 Visit Sawdust 2 Stitches here!! Thank you all so much for taking the time to hang out with me for a bit. Have fun building and I will talk to you all real soon! 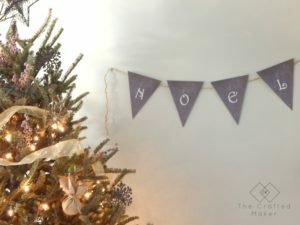 Hey Chrissie… Just found your site… some awesome stuff here! I really like this project. 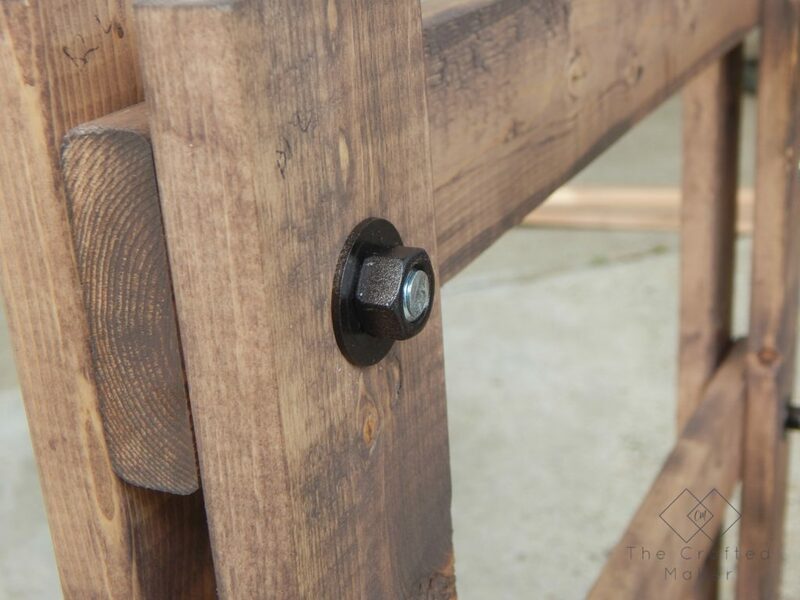 I never of thought of spraying nuts and bolts…. my wife and I really like the look of them, thanks for sharing that tip! 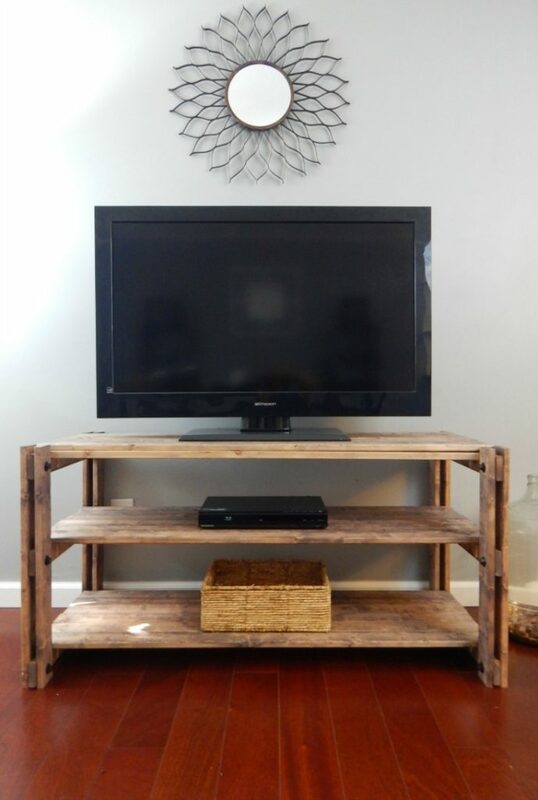 I also love the design of this TV stand. 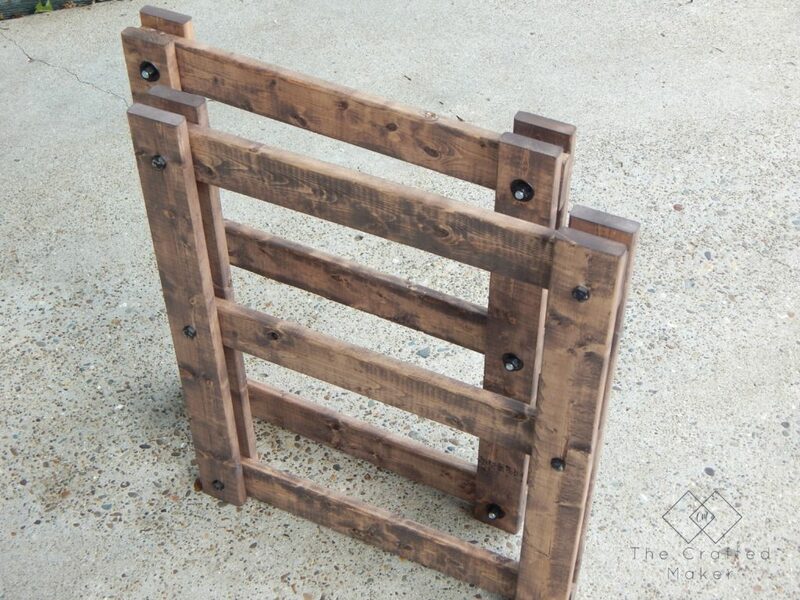 I gonna try to modify it a bit by using some reclaimed pallets that I had been saving. Appreciated the details and the pictures on how it all goes together! Thanks Ed! 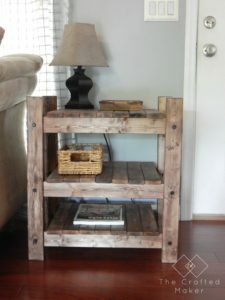 This would be amazing with reclaimed pallets. I would love to see it when you are finished.